In today’s society there are so many options when it comes to food! Our supermarket shelves are filled with prepackaged foods that are targeted to those of us who are ‘time-poor’ (ie. the majority of the population! ), as that ‘quick’ solution for breakfast/lunch/dinner or snack time! More and more commonly these same food are being marketed as ‘low fat’, ‘low carb’ ‘healthy’ alternatives- a clever marketing ploy which has caught all to many of us out on many occasions. Depend on fresh fruit and vegetables for fibre, vitamins and nutrients. Carry a cooler packed with Clean foods. Basically, many clean eating diets are based around plenty of fruit & vegetables, lean meats and (with some exceptions) non/minimally processed grains (ie whole grains). Some may also insist that their food be certified organic, again to minimise the intake of any chemicals. Eat plenty of fruit and vegetables, milk, eggs and whole grains (brown rice, quinoa, oats) (as a vegetarian I avoid the lean meats- but they would generally be included in most peoples idea of clean eating). Avoid prepackaged or processed/refined foods (as much as possible). I do still include bread (rye) unless I am being particularly strict for some training related reason. By doing this I am also avoiding any sugar and artificial colours, flavours or preservatives (especially artificial sweeteners). Whilst I am aware that there is no scientific evidence to show these compounds are harmful in any way, I prefer to minimise the amounts of these in my diet for personal reasons. What I think it is important to recognise is that you will likely not be able to stick with these principles 100% of the time and may need or choose to treat yourself to your favourite takeout meal or chocolate bar. It all comes down to moderation. If you can apply these principles 90% of the time you will likely feel much better for it! Clean eating is beneficial simply because it focuses on us eating the fruit, veges, lean meats, dairy, grains, nuts/seeds/legumes etc that we should be eating! At the end of the day the principles are nothing new… they were the formations of the food pyramid how ever many decades ago. Clear out your Pantry! As long as you have anything in your fridge/pantry that you are going to be trying to avoid (eg. sweets, chips, alcohol, soft drink) its going to be difficult to go without. Get in there and throw them out! This is about changing your lifestyle (and your taste palate whilst you are at it!). Plan! Plan! Plan! As they say ‘Prior Preparation Prevents Piss Poor Performance’ and this is just as true in the kitchen as it is in any other aspect of your life. Find some ‘clean eating’ recipes (check out some links below) you would like to try and plan your meals for the week. If you don’t plan what you are going to eat it is going to be all to easy to reach for those ‘ready to eat’ meals or the chocolate bar when 3:30itis hits at work. Get shopping! I’m not sure there is many nicer ways to spend a Saturday or Sunday morning then at your local farmers markets stocking up on fresh local produce (for cheaper than you can get at the supermarket). Don’t fret if you can’t make it to the markets, get down to your local shops and get stocked up with plenty of fruit and veges (fresh or frozen! ), meats and the rest to keep you going all week. Cook Ups This is my number one tip for keeping your eating on track during the week. Schedule some time each week to prepare your meals (even precook and freeze them!) and snacks for the week. 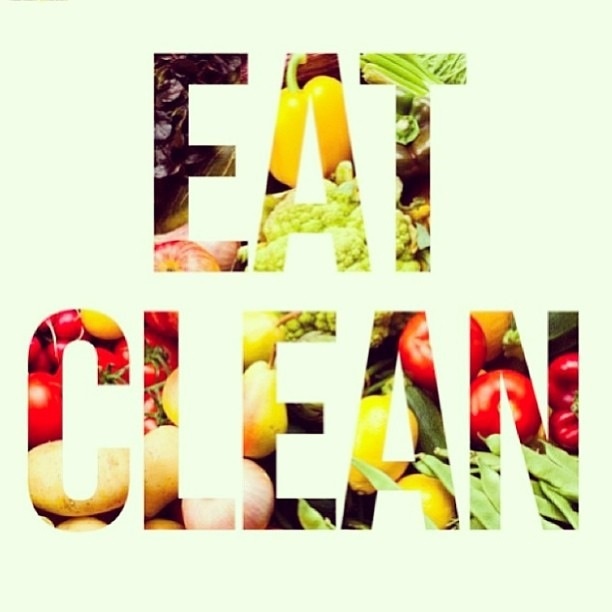 This will keep you eating clean until you allow yourself your…. Cheat Meals As I said above- life should be enjoyed and you should allow yourself your favourites in moderation (you will likely find that when eating clean your taste palate and therefore your favourite ‘cheat’ meal will change!) This is not about restricting yourself, its more about nourishing your body to get the best out of it that you can! !